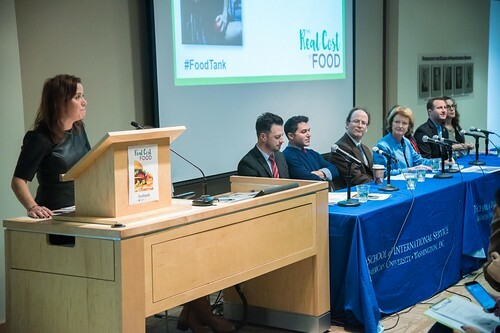 Earlier this month,Â Food Tank, a non-profit organization dedicated to building a sustainable global food system, hosted a panel atÂ American UniversityÂ that brought together students, community members, and leaders in the food sphere. The panel, called â€œThe Real Cost of Foodâ€ examined the social, environmental, and health impacts of producing food using an economic model called True Cost Accounting. True Cost Accounting is a way to analyze and value the food we eat based on everything that goes into producing that food. When you go to the grocery store and buy an apple, the price you pay at the register is only a fraction of what it actually cost to produce that apple. Thatâ€™s where True Cost Accounting comes in. It calculates a true value by factoring in the environmental costs (including water use, energy consumption, and damage from pollution and pesticides), economic costs (namely agricultural subsidies), social costs (such as equity, quality of life, and fair wages), and health costs (including hunger, obesity, disease caused by poor nutrition, and antibiotic resistance). All of that is to say that if you think youâ€™re getting a better deal ordering a burger off the dollar menu at a fast food joint instead of a grass-fed, humanely raised one at sustainable restaurant, youâ€™re really not. That cost is still being incurred, youâ€™re just not the one paying it. According to theÂ United National Food and Agriculture Organization,Â producing the 550 billion Big Macs sold each year in the US creates 2.66 billionÂ pounds of carbon dioxide, and researchers from theÂ McKinsey Global InstituteÂ estimate that excess weight and obesity costs the US $2 trillion globally in healthcare costs. The money you save by getting that fast food burger is the result of cutting environmental, economic, social, and health costs. A restaurant that sells a more expensive burger isnâ€™t overcharging you â€“ they are more accurately factoring in the true cost of producing that burger. A fast food joint that sells a 99-cent burger is shirking their responsibility and instead passing off expenses to the environment, to workers, and to society. Food Tankâ€™s full report is fascinating â€“ it takes a much deeper look at True Cost Accounting, and examines both the negative effects as well as the positive benefits in the equation. It presents the copious research done on the topic from around the world, and lays out a path for the future. I highly recommend checking it out for yourself to see what the food we eat is really costing us. It can be downloaded by clicking on the link to the report onÂ this page. Food Tankâ€™s founder,Â Danielle Nierenberg, is the driving force behind this report and the other work that the organization does. With deep roots in the DC area and experience with agriculture and food production all around the world, I wanted toÂ chat with her to find out more about why sheâ€™s dedicated her life to this work, and where Food Tank and the global food system areÂ heading. Lani Furbank: What motivated you to get involved in the food sphere and what is your educational and professional background? Danielle Nierenberg: Getting interested in food started for me as a Peace Corps volunteer in the Dominican Republic. I really saw the connection between how farmers were growing food and public health and the impact on the environment. Before that, I was an environmentalist. I grew up in a small town in the Midwest of about 300 people called Defiance, Missouri. I grew up around farmers and didnâ€™t think they were all that smart, to be honest, and sort of looked down on them. Being a Peace Corps volunteer made me realize, gosh, I grew up with all these crazy amazing people who are doing amazing thingsâ€¦ Just learning from farmers on the groundâ€¦ and realizing that farmers arenâ€™t villains, theyâ€™re not destroying the environment, theyâ€™re really trying to do a lot of things that will benefit us all. And so that led to me going to theÂ Tufts University Friedman School of Nutrition Science and PolicyÂ to study in a program called Agriculture, Food, and Environment, which really brought all those things together, so I have a Masters of Science from Tufts. LF: What inspired you to take those experiences and start Food Tank, and what stood out to you about the need for an organization like this? DN: I was working for many years at an environmental think tank in DC, theÂ Worldwatch Institute, which was started byÂ Lester BrownÂ in 1974, and if you had asked me as a nerdy high school student where I wanted to work, I would have told you the Worldwatch Instituteâ€¦ I had a foundation grant to study agricultural innovation, mostly in sub-Saharan Africa, and at that time I visited about 35 countries, by now Iâ€™ve visited 60 plus, and really interviewing hundreds of farmers and researchers and scientists and NGOs and advocates and activists and journalists and professors on the ground and really getting their thoughts about whatâ€™s working to help alleviate hunger, poverty, food loss, and food waste, and all these other problems we see in the food system, and really learn from them what they were doing to solve these things. So working at this environmental organization was a great experience for me, but as environmental think tanks go, some of them tend to be a little doom and gloom. And I was seeing a lot of hope and success on the ground and really wanted to show people whatâ€™s working, what can foundations invest in, what can consumers get excited about, what can farmers learn from other farmers in parts of the world. So thatâ€™s really what inspired me to start Food Tank and be able to tell those stories of hope and success to our audience. LF: In your travels for Worldwatch and your work with Food Tank, it sounds like youâ€™ve encountered a lot of people who are contributing to reforming the food system. Can you share a success story? DN: I was able to visit this group of women farmers in Niger, which is one of the poorest countries in the world, and they organized themselves into a co-op with the help of a research organization called the International Center for Agriculture in the Semi-Arid Tropicsâ€¦ They were growing a variety of crops including trees, fruit trees, indigenous crops, and also a lot of vegetables, and then able to feed their families with this food, but also have a surplus to sell at marketâ€¦ Theyâ€™re about 50 of themâ€¦ They were making about $300 per year before they started the farm, and now they make around $1500 per year, each of these womenâ€¦ I mean, thatâ€™s not a lot of money, theyâ€™re making about $5 a day right now, from 90 cents before, but when you ask them how their lives have changed, they say things like, â€œI was able to buy my husband a bicycle so he can get to his field where heâ€™s growing cotton, or other crops,â€ or â€œIâ€™m able to send my children to school,â€ â€œIâ€™m fatter now.â€ These women were not fat at all, but they were better nourished, is what they were trying to tell me. So itâ€™s those kinds of things that can really transform peopleâ€™s livesâ€¦What really, I think, matters, is how theyâ€™ve been able to improve and set an example for their families and their communities, and show that they can pull themselves out of what is a really dire situation, and I just think those kinds of things are so inspiring. LF: Food Tank is only a couple of years old, but itâ€™s already making a splash, partnering with major organizations, putting out research, and more. What are you most proud of so far? DN: We set out to not try to reinvent the wheel, we want to really be a platform for the good food movement. We donâ€™t want to compete with other organizations; we really want to propel what theyâ€™re doing to a wider audience. So I think our partnerships, which range from small non-profits to theÂ United Nations Food and Agriculture Organization, weâ€™ve really been able to bring a different group of stakeholders together and help break down those silos that exist in the food system, where you donâ€™t have farmers talking to scientists or scientists talking to nutritionists, or anyone talking to the funding and donor communityâ€¦We had a very successful big event in January of this year in collaboration with the George Washington University, it was our first annualÂ Food Tank Summit. Next year, weâ€™ll be having four Food Tank Summits, one in DC in April, another SÃ£o Paolo, Brazil in May, one in California in September, and then finally one in Chicago in November. But weâ€™re really proud of being able to partner with different organizations and pull amazing speakers together, not just to have boring PowerPoint presentations, because we all go to those conferences all the time, but to engage in real dialogue on stage and with our audience so that people can feel that theyâ€™re part of something, that theyâ€™re not just listening to talking heads. LF: It sounds like that first annual Food Tank Summit was a big success. What were some of the highlights of that event, and whatâ€™s in store for your second Food Tank Summit? DN: Weâ€™re really proud to partner withÂ Kathleen Merrigan, whoâ€™s the former Deputy Secretary of Agriculture, and is now theÂ Executive Director of Sustainability at George Washington University. Sheâ€™s such an incredible leader in this space and being able to share her wisdom with our audience was great. We had everyone fromÂ Tom ColicchioÂ toÂ Congresswoman Chellie PingreeÂ speak, it was just an incredible way to get farmers and policy makers and others really talking to one another. That summit sold out within minutes of us announcing it. We had a 1500 person waiting list and 300 tickets were sold. We just are really looking forward to expanding these over the next yearâ€¦ This year, we had a two-day event with panels each day, and some of the feedback we received is people were really inspired and excited to learn a lot of new things, but then they didnâ€™t know what to do with it. So with each of these events weâ€™ll have one day of listening and creating conversation and then another day of doing, whether thatâ€™s being on Capitol Hill, or visiting urban farms, or with our SÃ£o Paolo event, weâ€™ll be having a visit to one of our board memberâ€™s farms, itâ€™s one of the largest organic farms in Brazil. In Chicago weâ€™ll have the opportunity to meet with local food activists and advocates who are doing amazing things. So just having a day where people are not just sitting in their seats and learning, but really getting out into these neighborhoods and communities and learning from people who are actually doing the work. LF: Your recent research report on theÂ Real Cost of FoodÂ was well-received by a large audience at American University. Can you tell us a little bit more about that report? DN: Again, our goal is not to reinvent the wheel, but we wanted to put together a lay of the land report that shows where true cost accounting in the food system is at, who are the organizations who are leading the efforts around trying to put a value, not necessarily a price, but put a value on both the positive and negative externalities, and then point a way forwardâ€¦ There needs to be more investment from businesses and policy makers, and the funding and donor communities, to really help farmers and all of us as eaters really know the true value of what weâ€™re eating. So that was a really excitingâ€¦we hadÂ Michael Berger, whoâ€™s one of the founding partners ofÂ Elevation Burger, which is a restaurant chain that serves only organic, grass-fed beef. We had academics from American University, we had leaders from theÂ Union of Concerned Scientists, who are one of the leading proponents of true costs accounting. So it was a really exciting way to get our message out there and show what work is being done, how can it be used, and really the importance of being able to value what weâ€™re producing and consuming. Lani Furbank is a freelance writer and photographer who covers the intersection of food, farming and the environment. She is based in the DC area and loves cooking, hiking and crafting. Read about her adventures atÂ www.LanisCupOfTea.com. Thanks Pamela & Lani for helping spread the word about True Cost Accounting and all the amazing work Dani and Food Tank are doing!